If U.S. State Sen. Carl Kruger (D-Brooklyn) has his way, a new proposal would make it illegal to walk, jog or bike across the street in New York while using your iPod. 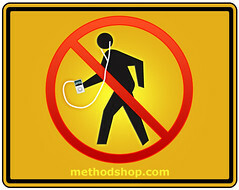 Kruger wants to slap pedestrians with $100 fines for using electronic gadgets, like the iPod, while crossing the street. Last year, Australian Police issued a similar law that banned cyclists from using their iPods after a series of fatal accidents. “This electronic gadgetry is reaching the point where it’s becoming not only endemic but it’s creating an atmosphere where we have a major public safety crisis at hand,” said Kruger in a telephone interview with Reuters. Two men were killed in his Kruger’s borough recently while listening to their iPods – one of which involved a 23-year-old who was killed in traffic while bystanders screamed “Watch out!” Kruger has named this safety issue iPod Oblivion, but the bill goes beyond just iPods. The bill seeks to ban all popular electric devices such as cell phones, Sony PSPs, Blackberries, etc. “If you’re so involved in your electronic device that you can’t see or hear a car coming, this is indicative of a larger problem that requires some sort of enforcement beyond the application of common sense,” Kruger said. Is an iPod crosswalk ban a little too Big Brother? Many people online aren’t taking the news of this bill too seriously. “I understand that they’re working on another bill in New York.” commented Digg.com user packernirvana. “A $200 penalty for those caught walking and chewing gum.” Maybe everyone just needs to exercise a little common sense when using their iPod. How hard is it to lower the volume and look both ways before you cross the street? Didn’t we all learn how to properly cross the street before we could tie our own shoelaces?